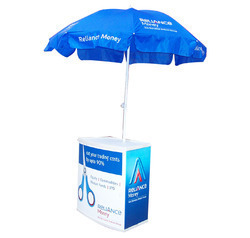 We offer to our esteemed clients the most excellent array of Promotional Table with umbrellas in the domestic market. These stalls are fabricated from optimum quality material and pioneering machines in tandem with set industry norms. The stalls we offer are tested on various quality parameters such as finish, durability and quality. Moreover, we offer these stalls in standard and customized option at pocket friendly prices.